It’s a question that I’m asked often as the president of the organization, and it’s one that I never tire of answering. Why? Because it’s the same purpose God has given to every Christian. Ligonier’s purpose is this: we want to help people know who God is. There’s nothing more important in life, is there? Scripture tells us that when people do not know God, they are slaves to sin and death (Gal. 4:8). All of history, in fact, is moving toward one goal: “The earth will be filled with the knowledge of the glory of the LORD as the waters cover the sea” (Hab. 2:14). You and I have no greater mission than to make the Lord of glory known around the world. And we’re grateful for friends like you who join us in this mission and enable Bible-teaching outreach that tells people about our great and holy God. God’s Word is clear that the purpose of life is to know God and to love and serve Him. That’s why our beloved founder, Dr. R.C. Sproul, always strove to keep Ligonier focused on the mission of proclaiming who God is, particularly in His majestic holiness. Sometimes anxiety, loneliness, and fear creep in, causing us to lose focus, to get distracted from the essential task of knowing God. I want you to be confident that in this new year of ministry, the board, Teaching Fellows, and team at Ligonier are as committed as ever to advancing R.C.’s singular vision to help people discover the character of God and what that means for their lives. We’re standing firm but we aren’t standing still, as R.C.liked to say. You are supporting the same truth-proclaiming ministry that Ligonier has always had, but we’re constantly looking for ways to tell even more people who God is. God is at work. And Ligonier is stepping in to fill a critical need for Christians around the world. If you’ve seen the recently released State of Theology survey results, then you know how ignorance about basic Bible teaching pervades the culture, and theological confusion reigns in the church. Your support is at work. Your generous donations make a real difference. Your gift today will serve more men and women, boys and girls, who look to Ligonier for help in growing in grace. We are at work. And this is true not only in the United States but around the world. With more international events than ever, 2019 promises to be a great advance for Ligonier Ministries, with strategic publishing and broadcasting efforts well underway in Spanish, Portuguese, French, German, Korean, Arabic, Chinese, and more. You can enable ministry that shows people who God is in His holiness and mercy. By God’s grace, people will be saved, lives will be changed, and fruit will abound to the Lord’s glory. Your support today is critical as we begin this new year of ministry. As a special thank you for your gift of any amount to Ligonier this month, we will send you five copies of the new booklet God Is Holy. 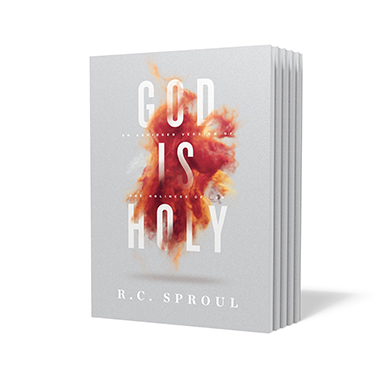 This is an excellent abridged version of Dr. Sproul’s groundbreaking work The Holiness of God, a book that God has used to renew minds and transform lives. In fact, R.C. helped us shape this work before he went to be with the Lord so that we would have a small book you can use in evangelism and as a discipleship refresher in the basic truths of who God is. We’ll send you five copies, one for yourself and several for you to share. I’m sure you’ll know just who to give them to. God used R.C. and Ligonier Ministries to change my life. I believe your gift will help many more people around the world discover who God is. P.S. Please respond today with your gift, and we’ll send you five copies of this not-yet-released booklet God Is Holy. Your gift is needed, necessary, and will immediately help position us for another fruitful year of ministry in 2019. Offer expires 3/31/19. Please allow up to six weeks for delivery after your gift is processed.